One of the most intensely written and beautifully conceived novels to come my way in many a season. I will be thinking about these characters for a long, long time. Seldom have I read a story with so much life on every page. Zacharias is a master. 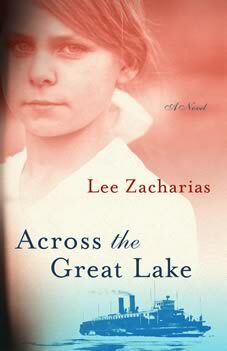 Lee Zacharias is one of those profoundly rare writers, a natural. Her voice is one you can trust, and her characters are real, moving, and come from the experience of someone who knows what trouble human beings get themselves into. We went to the ice. That was the year my mother died, but I do not remember her. What I remember is the ice, everywhere I looked, a world made of ice, and then the fire. But first there were the voices. Was I listening outside the closed door? Surely my mother taught me better, had told me that eavesdropping was not something a polite little girl would do. Such a strange word, eavesdropping. Did I know it then? Was I already a bad girl? Perhaps she despaired of me, I don't know. We got stuck in the ice, there was a storm, and while we were gone my mother died. My father was not a man of words, and now that so many years have passed, there is no one left to ask whether I was ever a good girl, a girl who might have deserved love, or not. "There's other women lost a child." A clot of silence seemed to thicken, though perhaps they only lowered their voices, perhaps I simply couldn't hear them. "For the last time, get up," he said. "You've another child needs tending." Did she answer? My father was a captain. When he spoke people listened. They did what he said. Perhaps she repeated "I can't," the only memory I really have of her, those two words in her voice. Or perhaps, when my father offered me as a reason for her to get back up and live, she said nothing at all. I had just turned five years old. In the hallway there was a yellow light in a sconce. It was a grand house, set against the hill on Leelanau Avenue, but the light had scorched a spot on the wallpaper, and there was a water stain near a seam, a small brownish lake in the green and gray print. I used to spend hours perusing those blotches, as if imperfection was what my eyes sought from the start, though I don't remember whether I noticed them that night. "All right then," my father said. "I'm taking the girl."